In the A96 trial, the traffic lights and crossing will be covered and out of use at the junction of Albert Street and Academy Street, in front of Rosebank Primary School. He added: “Safety is our main priority and, together with Highland Council and the community group, we have explored this option. The announcement was warmly welcomed by the chairman of Nairn Suburban and West community council, Richard Youngson on Monday who described it as “ideal”. He said that “we suggested it to Transport Scotland. There are too many lights in the same zone and that’s a distraction and can be confusing for drivers”. He said: “Safety for Rosebank Primary School is paramount. What we really want is a safety barrier all the way to Leopold Street for the little kids shooting in and out of school. “Our aim is safety: to keep parents and kids safe and the Leopold St crossing is by far the most effective”. Pedestrians will then be able to use the Leopold Street crossing but Transport Scotland is yet to confirm the exact start-date of the trial with appropriate signage still to be put in place. 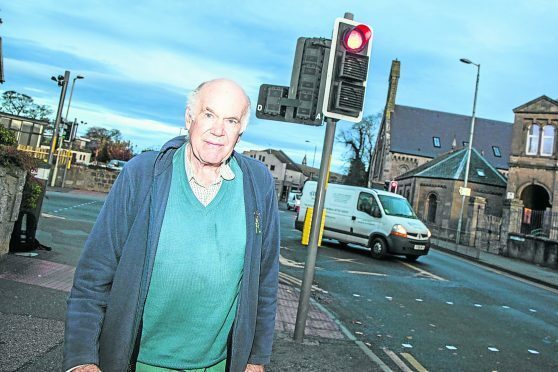 Locals have long complained about the state of congestion in the town warning not just of traffic delays but also dangers inherent in the situation due to the Inverness and Aberdeen A96 trunk road running through the town centre. The zone set for the trial was the scene of a fatal accident in October 2015 when 80-year-old Margaret Ritchie from Inverurie died after being struck by an HGV vehicle on Academy Street.